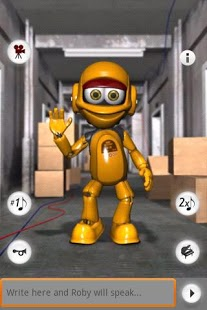 Roby is a talking, hip-hop dancing robot. He can speak the words you type on your keyboard. He also repeats anything you say with his robo voice. Try to poke or pet Roby to see his reactions. Press buttons and see Roby dance. You can even record your own videos of Roby and share them on YouTube, Facebook or send them to your friends and family by email. -Type a word or a sentence and Roby will speak it. -Talk to Roby and he will repeat your words with his robo voice. -Poke Roby in the head, body or arms and watch his reactions. -Pet him and he will like it. 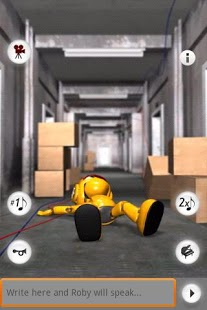 -Shake your device and see how Roby keeps his balance. -Press button to see Roby dance. -Record videos and upload them to YouTube & Facebook or send them by email. 1.0.3: One new free animation.